Ambiance is an online video slot developed by iSoftBet that has 5 reels and 20 fixed paylines. It has a Wild and a Scatter that launches a bonus round of free spins. Ambiance is themed to music and uses musical notes as symbols that also have a soft neon glow. The Scatter symbol is a Treble Clef and every time one appears on the reels it is "collected", you can see how many you have by looking at the number below the treble clef on the control panel at the bottom of the reels. When five or more have been collected they activate the same number of free spins, so if you have collected 4 and 2 more land on the reels at the same time you will have collected a total of 6 symbols and will therefore receive 6 Free Spins. For every Scatter that lands during the fee spins you will receive an additional free spin. During every free spins 2 - 5 Wilds will appear in random positions on the reels which will increase your chances of landing winning combos. Discover more online slot games with free spins and other bonus options. To create a winning combination you need to have 3, 4 or 5 identical symbols appearing on adjacent reels, along an active payline, starting with the leftmost reel. The payouts listed below are based on a line bet of one credit, which means the total bet is 20 game units. The slot comes with two types of special symbols, each with unique properties and functions. The Wild is a symbol that says Wild and it can replace any regular symbols to create or extend a winning combination except for the Scatter. It does not pay rewards of its own. The Scatter symbol is a treble clef and 3, 4 or 5 of these symbols appearing anywhere on the game screen pay 200, 600 and 2,000 credits. They will also trigger the bonus round of free spins with guaranteed Wilds as described in the bonus round section. 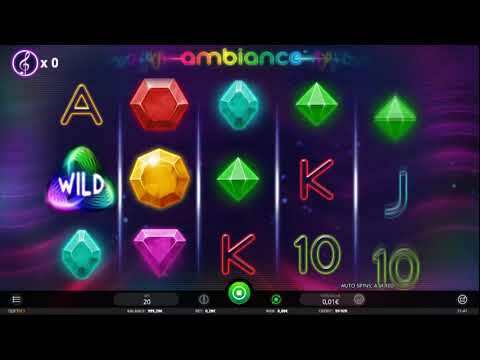 Ambiance is a slot with average payouts and a bonus round of free spins. It has an atmospheric design and a user-friendly control panel. It is available in demo version to play for free at neonslots.com. The number of active paylines in the Ambiance slot by iSoftBet is fixed at 20. The bet per line is the only parameter you can adjust. Click on the button in the bottom left corner to set the line bet in the range of 0.01 to 1 credit. The total bet, or the cost of one spin, is determined by multiplying the line bet by 20 (which is the fixed number of paylines) and is displayed in the Bet window. The total bet is 20 credits with the maximum line bet. The Winnings section shows your latest win. A click on the Spin button will spin the reels once. During the spin you can click on it again to instantly stop the reels. You can also spin the reels by using the Spacebar on the keyboard. Bet Max sets the maximum bet and spins the reels once. The Auto spin button opens a menu where you can determine the number of autospins in the range of 5 to 1,000 and set limits of your loss or win per spin. Once you are happy with your settings then one click on the start button will start the autospin mode. Click on the Stop button to disable this mode instantly. You can open the information window by clicking on the Pay Table button. This window shows the paytable, gives descriptions of special symbols, explains the round of free spins, shows the payline patterns and lists the main game rules. All the figures in the paytable are shown in credits and are automatically recalculated when you change the line bet. The Shortcuts section displays the list of all hot keys that you can use to control gameplay.